Eosinophilic esophagitis (EoE) is an allergic condition that causes inflammation of the esophagus (the tube that sends food from the mouth to the stomach). The most common symptom of EoE is difficulty and sometimes pain in swallowing solid foods. Eosinophilic Esophagitis: Management in 4 steps (click here to enlarge the image). Diagnosis based on blood eosinophil count at presentation (click here to enlarge the image). Tests to find the cause of eosinophilia (click here to enlarge the image). 8 foods cause 90% of food allergies (TEMPS WFS) (click to enlarge the image). The likelihood of a negative oral food challenge is shown in relation to the respective values of skin prick test (SPT) and serum IgE (sIgE). 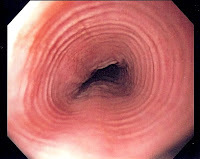 Eosinophilic esophagitis. Allergy, Asthma & Clinical Immunology 2011, 7(Suppl 1):S8. Figure 2. Proposed algorithm for the diagnosis and management of EoE. Image source: Eosinophilic esophagitis, Wikipedia, GNU Free Documentation License.